Wonder Man, what is the secret of your powers? Won't you take me far away from the mucky-muck man? Heroes from around the globe team up to vanquish evil wherever they find it. Man, what is it about Wonder Man that makes toy companies pair him up with Brits? The Minimate came with Union Jack, and now the Marvel Legend shares a release with Captain Britain. And it's not like he's an especially international hero or anything: he was a businessman who was bought out by Tony Stark, then got powers from Baron Zemo in order to get revenge. He turned good, and moved to Hollywood to become a stuntman and actor since his powers protected him from harm, which seems like something that would definitely be taken advantage of in a world where super powers exist. I mean, the Marvel Universe has an entire superpowered wrestling federation, of course movie stuntmen would be semi-invulnerable. 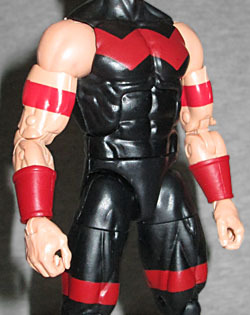 The last Marvel Legends Wonder Man was no looker: he was squinty, he was making a weird face... he looked like someone's stereotypical Italian goombah uncle. This new version looks like John Cena with black hair dye. Considering that he's being portrayed by Nathan Fillion in GotG2, it's a bit surprising they didn't go that route. 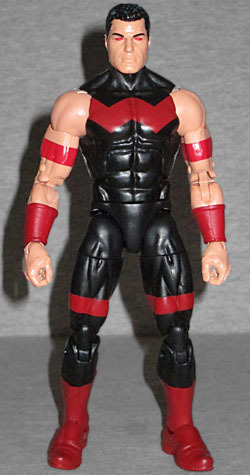 Like ToyBiz, Hasbro has made Wonder Man with a reused body. Unlike ToyBiz, Hasbro chose one that makes sense. It's the medium body, the one that was created for Simon's brother! They share half their DNA, it only makes sense that they'd have similar physiques. He does get new forearms, with sculpted bracers on them. The costume he's wearing is a version of the one Bob Hall designed for him in West Coast Avengers (aka "the only good one he's ever worn): it's black with a red W on the chest and back, and red boots. The red stripes on his biceps and thighs, as well as the lack of a belt, help identify this as an Uncanny Avengers version of the character. Prior to Marvel NOW!, the energy that comprises Wonder Man's body had begun leaking, giving him mental problems and leading him to view the Avengers as a threat. Once he was cured, he still thought superheroes' violence was a problem, so he became a pacifist, joining the Avengers Unity Squad mainly to handle their PR, not to fight. Despite this, the figure has all the usual ML articulation: swivel/hinge rocker ankles, swivel shins, double-hinged knees, swivel thighs, balljointed hips, swivel waist, hinged torso, swivel/hinge wrists, double-hinged elbows, swivel biceps, swivel/hinge shoulders, hinged neck and balljointed head. 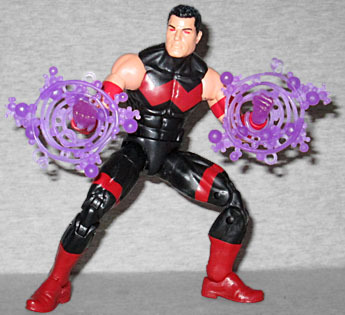 While we don't get a purple "ionic" variant of Wonder Man this time, we do still get a display of his powers. The figure includes two translucent purple fists and two translucent purple energy effects to clip onto them, to suggest he's powering up and about to punch the holy hell out of something. Neat choice! He also has a piece of this series' Build-A-Figure, Abomination. His is the right leg, which isn't much taller than Simon's own legs, but at least twice as thick. Making Wonder Man and Captain Britain swap figures may seem like a weird choice, but they do have at least one connection: when ToyBiz made them, they were both repaints of Black Panther. Is that why Hasbro chose to pair them? No clue, but this is a good toy regardless.